© 2000 Plant Health Progress. Accepted for publication 14 September 2000. Published 13 October 2000. Chastagner, G. A., and Benson, D. M. 2000. The Christmas tree: Traditions, production, and diseases. Online. Plant Health Progress doi:10.1094/PHP-2000-1013-01-RV. Christmas trees are an important specialty crop. Each year approximately 33 to 36 million Christmas trees are produced in North America and 50 to 60 million trees are produced in Europe (23, 29, 54, 55). In the United States, there are an estimated 15,000 growers, which includes 5,000 choose and cut farms. These growers produced 33 million trees in 1998 with an estimated farm gate value of $462 million. 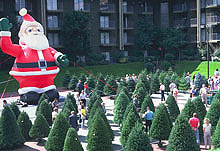 Based on a standard 6- to 7-foot-tall tree, it is estimated that consumers spent about $1.5 billion for Christmas trees in 1998. A number of tree species are grown as Christmas trees. However because of their superior postharvest needle and moisture retention characteristics, demand for noble and Fraser fir Christmas trees has increased rapidly. This paper takes a historical look at the Christmas tree industry and discusses three diseases that are limiting growers' ability to meet the demand for noble and Fraser fir in North America. The use of evergreens to decorate homes during winter celebrations dates back to Biblical times. By the 7th century, the pagan custom of using greenery to celebrate the winter solstice became a part of religious Christmas festivities, but it was in the 16th century that Germans in Strasbourg began cutting firs from local forests for display at Christmas. In later years, these trees were decorated with cutout paper flowers, fruits, cakes, tinsel and sugar. By the 18th century, Christmas trees were being decorated with wax candles and by the end of the century decorated Christmas trees could be found throughout Germany (2). Christmas trees were seldom used during the early years of the British Colonies in North America. Although emigrants from northern Europe brought their tradition of displaying Christmas trees during the celebration of Christmas to North America, it wasn't until Hessians joined the British forces during the Revolutionary war that there was an increased use of decorated Christmas trees (2). The Hessians were reported to have set up Christmas trees in the homes of families where they stayed. They were also noted for their festive Christmas celebrations, which are reported to have led to their defeat by General George Washington at Trenton, NJ on December 26, 1776. Among the earliest documented use of decorated Christmas trees in North America are a decorated and illuminated Christmas tree that was set up in a German commander's home to the north of Montreal, Canada in 1781 and a tree that was displayed at Fort Dearborn, MI in 1804. According to Albers and Davis (2), Mark Carr established the first Christmas tree market when he harvested fir and spruce trees from the Catskill Mountains and sold them at the Washington Market in New York City in 1851. By the 1880s, 200,000 trees were being shipped into the Washington Market by wagons, trains, and ships from forests as far away as New Hampshire and Massachusetts. In the west, Douglas-fir (Pseudotsuga menziesii) was being harvested from forests in western Washington and shipped to markets in Texas and southern California prior to 1920 (59). Fig. 1. 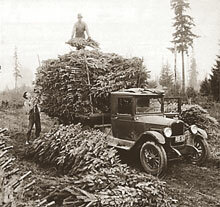 Harvesting Douglas-fir trees from natural stands during the early 1940’s near Shelton, WA. Courtesy of the Pacific Northwest Christmas Tree Association. Although some of the industry pioneers started to grow Norway spruce (Picea abies) and Scot's pine (Pinus sylvestris) in Christmas tree plantations during the early 1900s, more than 90% of the trees being harvested in the late 1940s were still coming from forest stands (Fig. 1). In 1948, the top selling trees were balsam fir (Abies balsamea), Douglas-fir, black (P. mariana) and white spruce (P. glauca), and eastern red cedar (Juniperus virginiana) (2). These species were readily available from forests. There have been a number of major changes in the Christmas tree industry in the past 40 to 50 years. After World War II, increasing numbers of trees were being planted in plantations and in the late 1940s and early 50s growers started to shear trees to increase their density in response to consumer demands for higher density trees (Fig. 2) (2, 24, 42). 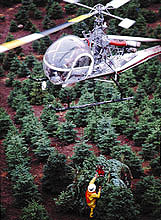 In the early 1980s some large growers began using helicopters to transport trees from the field to their shipping yard to increase the efficiency of harvest and minimize mechanical damage (Fig. 3). Fig. 2. Sheared trees display at a Pacific northwest grower meeting. Fig. 3. Helicopters are used to increase harvest efficiency and reduce mechanical damage to trees. Fig. 4. Fraser fir plantation in North Carolina. Today, over 95% of the Christmas trees harvested each year come from plantations (Fig. 4) and the most common species are Douglas-fir, Fraser (A. fraseri), noble (A. procera), and balsam firs, Scot's, Virginia (P. virginiana), and white pines (P. monticola). Overall, the Pacific Northwest (PNW) and North Carolina produced about 60% of the trees harvested in the United States in 1999. Nationally, Oregon ranks number 1, producing about 9 million trees per year, followed by North Carolina at 7.5 million trees. Washington is tied with Michigan in third, producing about 4 million trees per year (5, 54, 55). With improvements in transportation, regional production is now shipped throughout the United States and trees are exported Japan, China, Hong Kong, Philippines, Canada, Mexico, Guam, Puerto Rico, and Samoa (54, 55). Fig. 5. Pacific northwest trees being delivered in Texas during early December. In Europe today, Germany produces an estimated 19 million trees followed by France at 9.2 million trees, Denmark at 8.5 million trees, Belgium at 5.2 million trees and the U.K. at 4.4 million trees (23). European consumers prefer more open trees with layered branches. Christmas trees are still displayed for a relatively short period of time right around Christmas and in some places, candles are still used to illuminate trees (23, 29, 61, 62). Although historically this was also true in the United States, today consumers tend to prefer more dense trees and start purchasing their trees shortly after Thanksgiving in late November (Fig. 5). This means that trees have to be harvested earlier and last longer when they are displayed indoors. During the past 40 years, the market for real Christmas trees has faced stiff competition from artificial trees (3, 4, 6, 24, 25, 42, 44, 50). While the total number of all types of Christmas trees used by consumers has increased from about 30 million trees in the late 1950s to 70 to 75 million trees today, the total market for real trees has been flat. In 1960, about 31 million trees were harvested. This has only increased to 33 to 36 million trees today, even though the U. S. population and number of households have more than doubled. The percentage of households using a real tree has declined from 73.5% in 1950 to 32.3% in 1995. People in the west are twice as likely to use a real tree compared to people in the south central part of the nation. In North America and Europe, there has been an increased emphasis on growing conifer species that have superior postharvest needle and moisture retention characteristics (2, 23, 24, 29, 61, 62). In North America, this has resulted in a tremendous increase in the production of noble and Fraser fir. This shift has coincided with decreased production of Scot's pine, and to a lesser extent, Douglas-fir. In Europe, the increased production of Nordmann (A. nordmanniana) and noble fir is displacing Norway spruce in their markets. Fig. 6. Noble fir Christmas tree (click on image for larger view). Fig. 7. Fraser fir Christmas tree (click image for larger view). Noble and Fraser fir are generally considered to have the best postharvest quality of any Christmas tree available today (14, 36, 37, 38, 39, 40, 51). When displayed in water at 20°C, these species can be expected to maintain high moisture levels with very little needle loss for at least six weeks. Noble fir (Fig. 6) is rapidly becoming the most important species grown as a Christmas tree in the PNW (52, 53). This species grows naturally in the Cascade Mountains and isolated locations within the Oregon Coast Range. Noble fir is found naturally at elevations ranging from 610 to 1,220 meters (2,000 to 5,000 ft) above sea level and can be successfully grown within the western portions of the PNW. Efforts in the United States to grow this species outside of its native range have met with limited success. Although Douglas-fir still accounts for about 45% of the total production in the PNW, noble fir's share of the production has increased from about 5% in 1969 to 45% of the harvested trees today or about 17% of the total U.S. production (26, 54, 55, 56). The production of Fraser fir in North Carolina has also increased dramatically. Fraser fir (Fig. 7) is closely related to balsam fir and is native to high elevations in the Appalachian Mountains in North Carolina. Most of the plantations that produce Fraser fir in North Carolina are located at elevations below 1200 meters (4,000 ft) and thus outside the areas of native stands. In 1970, 50% of the Christmas trees produced in North Carolina were Fraser firs. In North Carolina today, Fraser fir accounts for about 96% of the production or about 20% of the total U.S. production. Typically, production of noble and Fraser fir Christmas trees requires a total of 12 to15 years. Seed are sown in seedbeds and seedlings are grown for 2 years. The resulting seedlings are transplanted to 'line out' nursery beds for one to three additional years (Fig. 8). Thus after 3 to 5 years, trees are large enough to be transplanted to the plantation, where they grow into a 6- to 7-foot tall Christmas tree in about 6 to 9 years. Fig. 8. Production of noble fir seedlings. With the increasing expansion of noble and Fraser fir plantings, growers are facing a number of insect and disease problems including. Balsam twig aphid (Mindarus abietinus), balsam woolly adelgid (Adelges piceae), and the spruce spider mite (Oligonychus ununguis) cause unsightly needle discoloration and/or branch distortion and dieback (Figs. 9-15). When populations are very high, balsam woolly adelgids can also kill Fraser fir trees (Fig. 16). 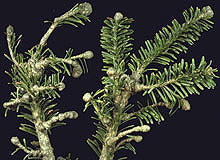 The three major diseases that currently limit the production and marketability of noble and Fraser fir Christmas trees are Phytophthora root rot and stem canker, current season needle necrosis (CSNN), and interior needle blight. Fig. 9. Twisting of newly developing Fraser fir shoots caused by balsam twig aphids (click image for larger view). Fig. 10. Balsam twig aphids on new Fraser fir growth (courtesy A. L. Antonelli) (click image for larger view). Fig. 11. Fraser fir with swollen branch nodes and terminals caused by balsam woolly adelgids (courtesy of R. S. Byther) (click image for larger view). Fig. 12. Balsam woolly adelgids caused the downward curving and branch flagging on this Fraser fir Christmas tree (click image for larger view). Fig. 13. Although difficult to find, the presence of white masses like these confirms the presence of balsam woolly adelgids (courtesy of A. L. Antonelli) (click image for larger view). Fig. 14. Severe spruce spider mite damage is often confined to the needle bases along the stem. Courtesy of A. L. Antonelli (click image for larger view). Fig. 15. Distribution of red-colored spruce spider mite eggs along the stem and needle bases (courtesy of A. L. Antonelli) (click image for larger view). Fig. 16. If not controlled, balsam woolly adelgids can cause severe branch distortion and death of Fraser fir Christmas trees (click image for larger view). Phytophthora root rot and stem canker is one of the most important diseases of Abies species that are grown as Christmas trees. For example, root rot, caused by Phytophthora cinnamomi, and to a lesser extent, P. drechsleri and P. citricola, is a serious problem on Fraser fir in nurseries and (Fig. 17) Christmas tree plantations in western North Carolina (9, 7, 30, 45, 57). Phytophthora cinnamomi also causes root rot on balsam fir in North Carolina (41). Phytophthora citricola causes root rot of white fir (A. concolor) and red fir (A. magnifica) in California (49). In Michigan, P. cactorum and P. citricola have been shown to cause root rot of Fraser fir, white fir, balsam fir, and noble fir seedlings in nurseries (1). This disease also occurs on noble fir Christmas trees grown in Ireland. Fig. 17. Wilting and mortality of Phytophthora-inoculated Fraser fir seedlings (click image for larger view). Fig. 18. Mortality of trees in a poorly drained area of field caused by Phytophthora root rot (courtesy of C. Landgren) (click image for larger view). In the PNW and North Carolina this is the most important disease of noble and Fraser fir Christmas tree production. As growers have tried to expand plantings to lower elevations and heavier textured soils, losses from this disease can reach 30% to 75% in unfavorable sites (Fig. 18) (8, 21). Because infested sites can no longer be used to produce noble and Fraser fir, this disease severely limits the ability of growers to increase the production of these species. Recent work in North Carolina indicates that average industry-wide losses from Phytophthora root rot are about 9% of the production in a given field or about $9 million based on a $100 million industry (9). Several species of Phytophthora are associated with serious diseases of conifers in the PNW. Phytophthora cryptogea, P. cactorum, P. gonapodyides, P. megasperma, P. pseudotsugae, and P. cinnamomi cause damage to a wide range of conifer seedlings in Oregon, Washington, and British Columbia bareroot nurseries (31, 32, 34). These species, along with P. cambivora and P. citricola, have also been associated with a root rot and stem canker disease of noble fir in Christmas tree plantations (18, 19, 21). Feeder roots of Fraser fir are infected initially by zoospores of Phytophthora spp. Roots typically will develop a reddish brown discoloration of the cambium region, which particularly on noble fir may extend up the stem (Fig. 19) as the pathogen colonizes the root system. As large roots are killed, above ground symptoms associated with Phytophthora root rot and stem canker develop, including chlorosis of foliage, wilting of new growth, branch flagging, stunting, and death of the tree (Fig. 20 and 21). Needles on branches and trees killed by Phytophthora root rot have a distinctive reddish-brown appearance. Fig. 19. Phytophthora-caused stem canker extending up the side of a noble fir tree (click image for larger view). Fig. 20. Noble fir branch flagging due to Phytophthora infection (click image for larger view). Fig. 21. Noble fir tree killed by Phytophthora root rot (click image for larger view). In some situations, Phytophthora species also cause shoot blight. Initial symptoms associated with shoot blight consist of a reddening of the needles at the tips of the shoots during late spring and early summer. The wood beneath the bark is medium brown with a distinct margin between the dead and healthy tissue. Affected branches can occur anywhere on the tree and the infection can spread down into the stem of the tree. Saturated soils favor the development of this disease. Phytophthora species produce sporangia (Fig. 22) that release swimming zoospores. These spores are attracted to nearby elongating or wounded roots where they encyst, germinate, and infect the root. Near saturated soil conditions are needed for germination, and dispersal of zoospores. Root infection is progressive and eventually leads to above ground foliar symptoms. Shoot blight can occur when growers use contaminated irrigation water to overhead irrigate trees or when overhead irrigation splashes infested soil onto the lower branches of the tree (49). 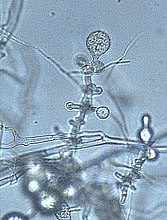 Some Phytophthora species produce resting spores [chlamydospores (Fig. 23) and/or oospores] in the infected roots that enable the fungus to survive for extended periods of time in the soil. Phytophthora spores may also spread within a field in surface runoff (Fig. 24) or in irrigation water from ponds, streams, and rivers (43, 63). Fig. 22. Phytophthora cinnamomi sporangium (click image for larger view). Fig. 23. Phytophthora cinnamomi chlamydospore (click image for larger view). Fig. 24. Missing Fraser fir trees resulting from Phytophthora inoculum spreading down hill with water (click image for larger view). The high susceptibility of many firs to Phytophthora root rot limits where these trees can be grown. Noble, balsam, grand (A. grandis), red, Fraser, and Shasta firs (A. magnifica var. shastensis) are among the more susceptible species, whereas Turkish (A. bornmuelleriana), European silver (A. alba), Veitch (A. veitchii), Nordmann, Momi (A. momi), and Korean firs (A. koreana) tend to be much less susceptible (10, 11, 22, 19, 31). There is also considerable variation in the ability of the different Phytophthora species to cause disease. In general, P. cinnamomi, P. cryptogea, and P. citricola tend to be more aggressive than the other species. The use of healthy transplant seedlings and site selection are the most important cultural factors affecting the management of Phytophthora root rot and stem canker in plantations (46, 58). Highly susceptible firs should not be planted on sites with heavy, poorly drained soils (33). Avoiding the use of overhead irrigation, particularly if the water is contaminated with Phytophthora inoculum, will prevent shoot blight. Fig. 25. Installing drain tiles prior to planting helps reduce Phytophthora root rot and stem canker problems in plantations (click image for larger view). Soil fumigation is commonly used in bareroot nurseries for transplant production to control Phytophthora root rot (35, 47). Fumigation in combination with spring and late-summer applications of selective fungicides has been highly successful in production of healthy transplants when combined with cultural practices and sanitation. Growers can alleviate high soil moisture conditions that favor disease development at some sites by installing drain tiles (Fig. 25). Soil fumigation is seldom used in Christmas tree plantations. Applications of selective fungicides have not generally been effective in controlling this disease on noble or Fraser fir in plantations in the PNW or North Carolina because of the difficulty in providing the volume of water needed to effectively drench the root zone of large trees and the need to make repeated applications. Although noble and Fraser fir are highly susceptible to Phytophthora root rot, there is considerable variation in the susceptibility Abies spp. to this disease. One potential option to minimize the impact of this disease in sites that are conducive to its development is to plant a species like Turkish or Momi fir that are less susceptible than noble or Fraser fir. Studies would have to be conducted to determine if these species have suitable horticultural characteristics for use as Christmas trees and determine if they have the excellent needle and moisture retention characteristics that are needed in today's market. Growers might also use less susceptible species as a rootstock for species such as noble and Fraser fir so they could grow these species in sites that are conducive to Phytophthora root rot (60). In addition to Phytophthora root rot and stem canker, there are two additional diseases that limit the production and marketability of high quality noble fir Christmas trees in the PNW. Current season needle necrosis (CSNN) is a poorly understood physiological disorder that occurs on noble and grand fir (A. grandis) Christmas trees grown throughout production areas in western Oregon, Washington, and British Columbia (15, 20). CSNN also occurs on noble fir in Ireland and Denmark. In Denmark, the condition is also referred to as "røde nåle på nobilis" (red needles on noble fir). In the PNW, initial symptoms of CSNN appear on current season needles during early June. Symptoms consist of tan discolored bands (Fig. 26). In some cases, the area of discoloration expands and involves the distal portion of needles or the entire needle. The incidence of symptomatic needles increases rapidly during June and July. Damaged portions of needles turn reddish-brown in color by mid summer (Fig. 27). Fig. 26. Initial symptoms of CSNN during late June (click image for larger view). Fig. 27. Symptoms of CSNN during late summer (click image for larger view). Fig. 28. High incidence of CSNN damaged needles in the top of a tree (click image for larger view). Unlike grand fir, where symptomatic needles are distributed throughout the tree, branches in the upper portion of noble fir trees can have twice as many symptomatic needles compared to branches in the middle and bottom portion of trees (Fig. 28). CSNN damage is strongly related to site, being more severe at low elevation offsite locations, which are typical of many Christmas tree plantings in the PNW. There is also considerable variation in disease development on trees in different areas within a given site. Growers' observations indicate that CSNN is less of a problem at higher elevation sites and in natural stands. Growers have also associated initial symptom development with high temperatures and certain trees tend to show symptoms year after year. Although the etiology is unknown, studies have shown that shading trees or foliar applications of calcium chloride during shoot elongation significantly reduce the incidence of symptomatic needles (20). These studies suggest that calcium deficiency may in part contribute to this disease. Although foliar applications of calcium chloride are effective in reducing the incidence of this disorder on both noble and grand fir, this treatment cannot be recommended as a management tool because of phytotoxicity associated with the rates and multiple number of applications required to reduce disease levels (20). Fig. 29. Grafted tree with CSNN symptoms on susceptible scion branches (upper) and no symptoms on resistant rootstock branches (lower) (click image for larger view). There is increasing evidence from the PNW and Denmark that the development of CSNN is under strong genetic control (Fig. 29). In Denmark, Christmas tree geneticist U. B. Nielsen has found that noble fir provenances from Oregon and Washington were much more prone to CSNN than highly selected Danish provenances (personal communication). Seed from noble fir trees in the Riley/Fanno area near Mary's Peak in the Oregon coast range have been shown to consistently produce high quality Christmas trees over a range of sites in the PNW (12, 13, 27, 28, 48). Recent research has also shown that there is considerable variation in the susceptibility of different families of trees from this seed source to CSNN (17). There was also a significant correlation between the percentage of unmarketable progeny trees due to CSNN and the CSNN ratings of the mother trees, indicating that it should be possible to breed for trees with resistance to CSNN. Fig. 30. CSNN on noble fir tree with blue colored foliage (click image for larger view). There has been some speculation that the limited susceptibility of the Danish provenances is somehow related to their dark blue coloration. This appears to be unlikely since the highly susceptible Riley/Fanno parents in the seed orchard also exhibited mature dark blue foliage characteristics similar to that which is associated with the highly selected Danish provenances (Fig. 30). Very little information is currently available regarding the effect of cultural practices with respect to this disorder. Data collected during a 7-year-long fertilization study indicates that fertilization with Urea-Sul (which is a blend of urea and ammonium sulfate and has a 33-0-0-12 analysis) or Sul-Po-Mag (which is also known as K-Mag and is a combination of sulfur, potassium and magnesium with a 22-22-11 S-K20-Mg0 analysis) did not affect the level of CSNN which developed on the noble fir Christmas trees in these studies (17). Studies relating to the etiology and management of this disease are currently underway in Ireland and the PNW. The development of procedures to induce CSNN under controlled conditions would make it possible to utilize seed obtained from controlled crosses between CSNN susceptible and resistant parents in seed orchards to obtain additional information concerning the genetic control of this important disorder of noble fir Christmas trees. Studies are currently underway to examine the possibility of reducing the severity of this disease with foliar applications of other types of calcium-based materials and a plant growth hormone called Conicur, which contains 2-hydroxypropanoic acid. Interior needle blight is the most important needle cast disease of noble fir Christmas trees (15). With the increased production of noble fir in the PNW, this disease is becoming more common. Trees affected by this disease are generally unmarketable. In 1998, one grower lost an estimated $1.4 million dollars because of damage caused by this disease. Although several fungi can be associated with diseased needles, an undescribed species of a Mycosphaerella-like fungus is most commonly found on diseased needles. Symptoms of this disease are most prominent during late summer and fall. They consist of random browning of older needles, mostly on lower branches. Eventually, all of the needles except the current season growth can be damaged (Figs. 31 and 32). This disease also occurs on grand fir in the PNW (Figure 33). Initially, symptomatic needles tend to remain firmly attached to the branch. Small black fungal fruiting bodies are present on the undersides of the needles. Although this disease occurs most commonly on larger trees, it can occur on young trees, particularly when they are inter planted among older diseased trees (Figure 34). Observations suggest that Fraser fir are resistant to this disease. Fig. 31. Interior needle blight symptoms on a severely diseased noble fir (click image for larger view). Fig. 32. Extensive development of interior needle blight symptoms on older noble fir needles (click image for larger view). Fig. 33. Interior needle blight symptoms on a severely diseased grand fir (click image for larger view). Fig. 34. Interior needle blight development on a young noble fir tree inter-planted among older diseased trees (click image for larger view). 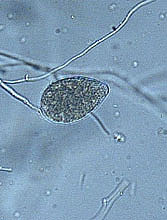 The Mycosphaerella-like fungus associated with symptomatic needles produces partly erumpent, black pseudothecia and ascospores that are hyaline, fusiform, 1-septate, and slightly constricted at the septum. Phaeocryptopus nudus, Phyllosticta abietina, Toxosporium spp., and Rhizosphaera spp. are sometimes also found on symptomatic needles. It is unclear whether all of these fungi cause disease, or whether some of these fungi are endophytes or simply infest necrotic needles that have died from some other factor(s). Fig. 35. Removal of lower branches has no effect on subsequent development of interior needle blight (click image for larger view). Little information is available about factors that affect disease development. The disease appears most commonly on trees in areas of plantations where air movement is poor, and/or in plantations that experience extended periods of free moisture on needles during the spring. Trees adjacent to tall timber or in plantations with poor weed control are examples of sites that appear to favor disease development. Attempts by growers to salvage trees by removing the branches on the lower portions of trees have not been successful (Figure 35). Applications of chlorothalonil during shoot elongation have provided effective control of this disease, suggesting that infections occur on the new growth shortly after it emerges from the buds (16). Based on fungicide studies, there also appears to be a very long incubation period with this disease. The benefits of fungicide treatments are not evident for at least 16 to 18 months. Under high disease pressure, chlorothalonil has been the only fungicide that provides effective control of this disease (Fig. 36 and 37). Unfortunately, when high-pressure sprayers are used or conditions do not favor rapid drying of the spray on the needles, applications of this fungicide can result in needle yellowing and/or the development of necrotic flecks on the needles. Fig. 36. Limited disease development on a tree sprayed with chlorothalonil (click image for larger view). Fig. 37. Extensive interior needle blight development on an unsprayed tree (click image for larger view). For growers to minimize the impact of interior needle blight on the production of noble fir in the PNW, additional studies are needed relating to the etiology and epidemiology of this disease. Studies are also needed to identify alternatives to chlorothalonil-based products that are effective in controlling this disease. Since the use of Christmas trees plays such an important role in the cultures of many people, demand will remain strong for species of Christmas trees like noble and Fraser fir that have excellent needle and moisture retention characteristics. Even though there are many innovative and successful noble and Fraser fir Christmas tree growers, Phytophthora root rot, CSNN, and interior needle blight are currently limiting the ability to meet the demand for these trees. Emphasis on production of healthy transplants coupled with careful site selection will help growers limit the damage caused by some of these diseases. Growers may also eventually utilize innovative approaches such as grafting noble and Fraser fir to rootstocks that are resistant to Phytophthora root rot. Long-term solutions to Phytophthora root rot and CSNN will no doubt come through breeding programs for disease resistance such as those that are underway in North Carolina and the PNW. 1. Adams, G. C., Jr. and Bielenin, A. 1988. First report of Phytophthora cactorum and P. citricola. Plant Disease 72:79 (abstract). 2. Albers, H. H., and Davis, A. K. 1997. The wonderful world of Christmas trees. 100 pages. Mid-Prairie Books, Parkersburg, Iowa. 3. Anonymous. 1996. Gallup poll shows real tree use surged in 1995. American Christmas Tree J. 40(2):13. 4. Anonymous. 1999. NCTA public opinion survey supplies upbeat information. Christmas Tree Lookout 32(2):22-24. 5. Anonymous. 1999. Christmas trees rank high in Oregon. Christmas Tree Lookout 32(3): 8. 6. Baumann, D. 1996. The Gallup poll revisited. American Christmas Tree J. 40(3):5-6. 8. Benson, D. M., and L. F. Grand. 2000. Incidence of Phytophthora root rot of Fraser fir in North Carolina and sensitivity of isolates of Phytophthora cinnamomi to metalaxyl. Plant Dis. 84:661-664. 9. Benson, D. M., Grand, L. F., and Suggs, E. G. 1976. Root rot of Fraser fir caused by Phytophthora drechsleri. Plant Dis. Rep. 60:238-240. 10. Benson, D. M., Hinesley, L. E., Frampton, J., and Parker, K. C. 1997. Evaluation of six Abies spp. to Phytophthora root rot caused by Phytophthora cinnamomi. APS Biological and Cultural Tests 13:57. 11. Benson, D. M., Hinesley, L. E., and Parker, K. C. 1997. Evaluation of Canaan seed sources for resistance to Phytophthora root rot caused by Phytophthora cinnamomi. APS Biological and Cultural Tests 13:58. 12. Brown, K. 1990. A few outstanding noble fir Christmas trees. Christmas Tree Lookout 23(3):22-23. 13. Brown, K. and Landgren, C. 1995. Results of the second noble fir Christmas tree provenance test. Christmas Tree Lookout 28(1):10-15. 14. Chastagner, G. A. 1990. Keeping cut trees fresh: A summary of tree keepability research at Washington State University. Christmas Tree Outlook 23(3):32-44. 15. Chastagner, G. A (Ed). 1997. Christmas Tree Diseases, Insects, and Disorders in the Pacific Northwest: Identification and Management. 156pp. MISC01886. Washington State University Cooperative Extension, Pullman, WA 99164-5912. 17. Chastagner, G. A. and Landgren, C. 1998. Genetic variation and the influence of fertilization on the development of current season needle necrosis on noble fir Christmas trees. pp 219-226. In: Laflamme, G., J. A. Berube, and R. C. Hamelin (Eds). Foliage, shoot and stem diseases of trees. Proceedings of the IUFRO WP 7.02.02 meeting, Quebec City, May 25-31, 1997. Natural Resources Canada, Canadian Forest Service, Sainte-Foy, Quebec. 272 p.
18. Chastagner, G. A, Hamm, P. B., and Byther, R. S. 1990. Symptomology of Phytophthora root and stem canker disease on Noble fir in the Pacific Northwest. Phytopathology 80:877. 19. Chastagner, G. A., Riley, K. L., and Hamm, P. B. 1990. Susceptibility of Abies spp. to seven Phytophthora spp. Phytopathology 80:887. 20. Chastagner, G. A., Staley, J. M. and Riley, K. L. 1990. Current season needle necrosis: A needle disorder of unknown etiology on noble and grand fir Christmas trees in the Pacific Northwest. pp 38-42 In Merrill, W. and M.E, Ostry (Eds). Recent research on foliage diseases, conference proceedings, Gen Tech. Rep. Wo-56 Washington, D.C., USDA Forest Service. 145p. 21. Chastagner, G. A, Hamm, P. B., and Riley, K. L. 1995. Symptoms and Phytophthora spp associated with root rot and stem canker of noble fir Christmas trees in the Pacific Northwest. Plant Dis. 79:290-293. 22. Cooley, S. J., Hamm, P. B. and Hansen, E. M. 1988. Susceptibility of Northwest conifers to Phytophthora root rot. Tree Planters' Notes 40:15-18. 23. Davidson, E. 1999. Ten day visit provides revealing snapshot of Irish tree business. Christmas Tree Lookout 32(2):30-32. 24. Davis, A. K. 1996. The history of the Christmas tree industry in North America. American Christmas Tree J. 40(4):5-11. 25. Drake, S. 1999. Gallup poll registers success…points direction for promotion. American Christmas Tree J. 43(2):26-28. 26. Douglas, B. S. 1983. Report on the 1982 marketing season. Northwest Lookout 16(2):2-6. 27. Douglas, B. S. 1984. How much influence does seed origin have on noble fir growth performance. Northwest Lookout 17(3):16-18. 28. Douglas, B. 1991. Winter-hardy noble fir seed sources. Christmas Tree Lookout 24(1):6-8. 29. Frampton, J., and McKinley, C. 1999. Christmas trees and greenery in Denmark – Production and tree improvement. American Christmas Tree J. 43(2): 4-11. 30. Grand, L. F. and Lapp, N. A. 1974. Phytophthora cinnamomi root rot of Fraser fir in North Carolina. Plant Dis. Rept. 58:318-320. 31. Hamm, P. B. and Hansen, E. M. 1982. Pathogenicity of Phytophthora spp. to Northwest conifers. Eur. J. For. Pathology 12:167-174. 32. Hamm, P. B. and Hansen, E. M. 1987. Identification of Phytophthora spp known to attack conifers in the Pacific Northwest. Northwest Science 61:103-109. 34. Hamm, P. B. and Hansen, E. M. 1991. The isolation and identification of Phytophthora species causing damage in bare-root conifer nurseries. Pp 169-179. In: Sutherland, J. R. and Glover, S. G., eds. Diseases and insects in forest nurseries. Proc. IUFRO Working Party S2.07-09. For. Can. Pac. Yukon Reg. Info. Rep. BC-X-331. 35. Hansen, E. 1997. Diseases in special settings: Forest Tree Nurseries. Pp 88 In: E. M. Hansen and K. J. Lewis (Edt.) Compendium of Conifer Diseases. APS Press, St. Paul, MN. 36. Hinesley, L. E. 1984. Measuring freshness of cut Fraser fir Christmas trees. HortScience 19(6):860-862. 37. Hinesley, L. E. 1990. Grower postharvest handling of Christmas trees. N. C. Coop. Ext. Serv., Christmas Tree Notes, CTN-015. 2 pp. 38. Hinesley, L. E. and Huxster, Jr., W. T. 1991. Retail merchandising of North Carolina Fraser fir. N. C. Coop. Ext. Serv., Christmas Tree Notes, CTN-017. 3 pp. 39. Hinesley, E. and Chastagner, G. 1993. Common myths and questions: the handling and care of cut Christmas trees. Amer. Christmas Tree J. 37(4):16-19. 40. Hinesley, L. E. and Snelling, L. K. 1994. Postharvest drying of Leyland cypress, eastern red cedar, and Fraser fir Christmas trees. HortScience 30:1427-1428. 41. Kenerley, C. and Bruck, R. I. 1981. Phytophthora root rot of Balsam fir and Norway spruce in North Carolina. Plant Disease 65:614-615. 42. Kerwin, J. 1994. A New Yorker searches for the most imperfect perfect Christmas tree. The Pennsylvania Horticultural Soc.Green Scene 23(2):4-7. 43. Kleijunas, J. T. and Ko, W. H. 1976. Dispersal of Phytophthora cinnamomi on the island of Hawaii. Phytopathology 66:457-460. 44. Koelling, M. R. 1999. Assuring there will be customers for real trees. American Christmas Tree J. 43(1):26-31. 45. Kuhlman, E. G. and Hendrix, Jr., F. F. 1963. Phytophthora root rot of Fraser fir. Plant Dis. Rep. 47:552-553. 47. Landis, T. D. and Campbell, S. J. 1991. Soil fumigation in bareroot tree nurseries. Pp 191-205. In: Sutherland, J. R. and Glover, S. G., eds. Diseases and insects in forest nurseries. Proc. IUFRO Working Party S2.07-09. For. Can. Pac. Yukon Reg. Info. Rep. BC-X-331. 48. Landgren, C. 1999. The continuing quest for better nobles: results from ongoing progeny testing. Christmas Tree Lookout 32(3):32-37. 49. McCain, A.H. and Scharpf, R. F. 1986. Phytophthora shoot blight and canker disease of Abies spp. Plant Disease 70:1036-1037. 50. McKinley, C. R. 1998. Where is the industry going? American Christmas Tree J. 42(4):37-40. 51. Mitcham-Butler, E. J., Hinesley, L. E. and Pharr, D. M. 1988. Effects of harvest date and storage temperature on the postharvest needle retention of Fraser fir branches. J. Environ. Hort. 6(1):1-4. 52. Nanny, B. 1986. Noble fir: That mysterious, difficult, and beautiful Christmas tree. Northwest Lookout 19(3):10-12. 53. Nanny, B. 1997. Looking to the future: What's ahead for the Christmas tree industry? Christmas Tree Lookout 30(1):17-19. 56. Proebsting, W. M. 1983. Harvest and planting rates of Christmas trees in Oregon. Northwest Lookout 16(2):20-22. 57. Shew, H. D. and Benson, D. M. 1982. Fraser fir root rot induced by Phytophthora citricola. Plant Dis. 65:688-689. 58. Sidebottom, J. R., and Jones, R. 1999. Control of Phytophthora root rot in Fraser fir Christmas trees. North Carolina Cooperative Ext. Ser. CTN022 , 4p. 59. Tompkins, D. 1986. A trip back into time with Paul Kirk. Northwest Lookout 19(3): 14-18. 60. Tompkins, D. 1989. Grafting noble fir: a 16 year experiment. Northwest Lookout 22(3): 10-12, 16-17. 61. Tompkins, D. 1999. An English "Christmas World". American Christmas Tree J. 43(4): 27-31. 62. Tompkins, D. 1999. Growing trees by computer and other innovations from England. American Christmas Tree J. 43(4):32-34. 63. Von Broembsen, S. 1984. Distribution of Phytophthora cinnamomi in rivers of the South Western Cape Province. Phytophylactica 16:227-229.